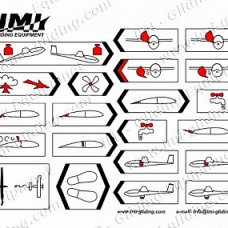 The sticky cockpit placard pictures are intended to indicate all control elements in a glider cockpit. 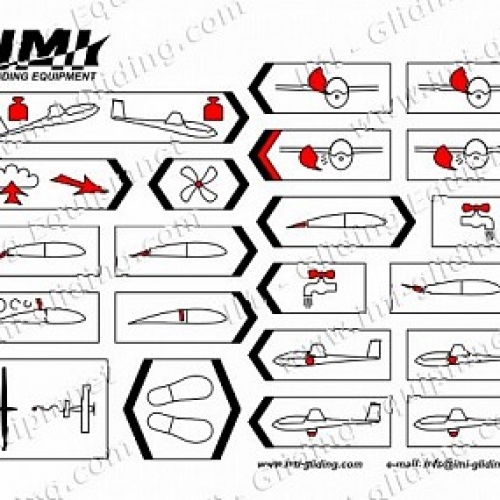 The design covers all common combinations for different glider classes, including flapped types. All stickers are pre-cut for easy peel-and-stick application. The shape does not need to be trimmed. There is one set of stickers per one-seat glider. For two-seater glider, two sets are necessary. The stickers are made of quality white PVC foil with abrasion-resistant paint. The stickers are UV resistant and withstand most common chemicals.